In this post, we have learn how can we insert multiple HTML5 contenteditable table data to mysql database table using PHP with jQuery and AJAX. For this things we have use HTML5 contenteditable attribute in table, this attribute allows to edit table cells by writing contenteditable attribute as true. So by using this attribute we can enter data to the table cells. Then after we have use Jquery code for append new table cells with contenteditable attribute tag as true. So we can append number of editable table cells and we can enter data into that table cells. Then after we have pass table cell data to PHP Script by using Jquery and Ajax. In Server Side PHP script will clean table cells data and make multiple Insert data query and by using mysqli_multi_query() function we have execute multiple insert query for Insert Multiple data into Mysql table. For making Multiple Inline Insert data example, we have use HTML5 Contenteditable attribute in table cell for add multiple Item information. By using jQuery code we can append number of blank table row into Item Add table. So at once We can enter multiple item data in the editable table cell and then after we can store those multiple data into mysql database on single clicking of a button. So by using this feature we can enter multiple inline table data insert into mysql table in a single click. 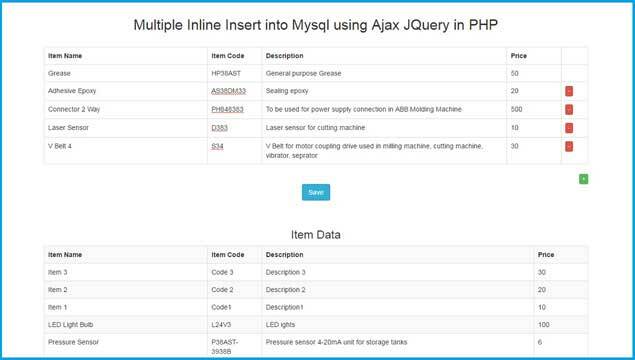 For sending data from table to PHP script we have use JQuery for fetching data from table cell and by using Ajax we have send that data to php script and in PHP script make multiple insert query and execute query. So in single click of button we can Insert Multiple Inline data into table without refresh of web page. i tried this code to my project but able insert single top most row, the other row are not getting inserted.